Bird feeding is the 2nd largest recreational activity in America! Are your bird feeders attracting the birds you want to see? How active is your bird feeding station right now? The most important thing about bird feeding is the amount of care and cleaning that is required. With routine maintenance you can increase the number and variety of colorful songbirds that visit your yard. If your Hummingbird feeders are in direct sunlight you will need to change the sugar water every 3-5 days! If the feeder can be relocated to a shaded area it can be cleaned and refilled once a week. 4 cups of water 1 cup of sugar. it will keep refrigerated for 2 weeks. DO NOT use dyes,coloring,honey or anything else! Replace old/wet seed as needed and clean feeders before each refilling for healhty birds. Use high quality fresh bird seed for best results! Offer a varity of seeds and mixes in different feeders at different heights for increased activity. IF your bird feeders seem to show a lack of interest, keep in mind that many birds are nesting. IF you havn't done so yet now is a good time to clean out the feeders inside and out and take apart to clean. When the the birds return with thier young to feed your feeders will be cleaned and refilled with fresh food. Keep your birdbaths clean and refilled with fresh clean water. Again if in the sun it will require a lot more cleaning. Birds require clean and fresh water just like us and our pets! Don't let the baths go dry to evaporation birds need water to drink and bath. A number of reports this spring/summer of bear damage to bird feeders. Do not use/provide raw beef fat/suet this is a huge attractant to any bears in the area. Remove your bird feeders each and every evening and store inside (shed/garage) not in your screen porch! 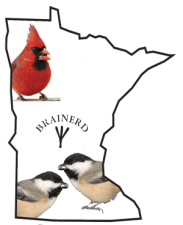 MN Backyard Birds offers the following services to ensure that your bird feeders are clean and safe on a routine basis to increase the number and variety of healthy songbirds! 1. Bird feeders are professionally cleaned and sanitized each week. 3. All seed safely stored offsite provided/delivered weekly. NO Mice, Moths or Mold! 4. Ensures healthy birds and more activity. 5. Provides year-round access to bird feeders (snow and ice). Can you see what you're buying? Seeing is believing! How fresh is this bird seed? Bird seed can go stale just like bread deterring many birds away. Am I buying waste grains and fillers? Please contact Judd Brink owner of MN Backyard Birds today to save you time and money. Enjoy more birds without the work!